About this Virtual Run: Have you heard the buzz? Bees need our help! Support a charity working to save the bees by running or walking in the Bee Healthy virtual 5k/10k/Half Marathon whenever and wherever you want. 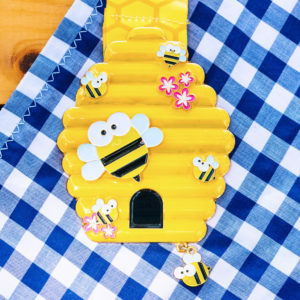 All registrants will receive this super-cute 4″ 3D beehive medal covered with bee charms – the largest bee actually wiggles in place! About the Charity: Planet Bee Foundation is a 501(c)3 environmental education nonprofit based in San Francisco. Their mission is to create a green-minded generation and inspire environmental stewardship through the teaching lens of the struggling honey bee and the power of individual action. Through their school programs, corporate team building workshops, and public education, Planet Bee inspires people to care for our environment and empowers them to take action to positively impact on our interconnected world. Since receiving their nonprofit status in 2015, they have taught over 12,500 students in schools at no cost! A portion of the proceeds from this virtual race (at least $5 from each registration) will be donated to Planet Bee Foundation. For more information about this organization or to make a direct contribution, please visit PlanetBee.org.